Nonsyndromic clefts of the lip and palate (CL, CP, CL/P) are among the most common congenital defects caused by multi-factorial etiological factors that include both environmental and genetic factors. There is sufficient evidence to hypothesize that disease locus for this condition can be identified by candidate genes. The purpose of this study is to investigate the prevalence of mutation in exon 7 of IRF6 gene to determine whether this mutation is implicated in the South Indian Dravidian population. Material and methods: Blood samples were collected with informed consent from 10 subjects with nonsyndromic cleft lip/palate and genomic DNA was extracted from the blood samples, polymerase chain reaction was performed and the products were subjected to direct sequencing. Results: There was a significant positive association between the occurrence of homozygous valine polymorphic variant and isolated CL, CP and CL or CP (90%, n = 9) relative to heterozygous valine and isoleucine variant (10%, n = 1) in the present study. Conclusion: The study is clinically significant because it has for the first time identified the genetic status of exon 7 of IRF6 in Tamil speaking Dravidian population. Science is providing us the tools to diagnose and treat an infection before it causes damage. For some decades now, bacteria known as probiotics have been added to various foods because of their beneficial effects for human health. Very encouraging studies have come up in recent past exploring probiotics in fields of caries, periodontal diseases and few other areas and the results tend to suggest beneficial effects of probiotics on oral health and on whole body in general. The application of probiotic strategies may, in near future, provide an end to many infections occurring in oral cavity. This article reviews the probiotic approaches, such as genetically modified Streptococcus mutans and targeted antimicrobials in the prevention of caries and discuss its future directions. Fully equipped mobile dental clinics provide on-the-spot diagnostic, preventive, interceptive and curative services to the doorsteps of the underprivileged, rural population. It's an innovative, on-site, dental outreach provider to bring state of the art, preventive dental care to those in need in the most comfortable and effective way possible. Homeostasis of tissues depends upon cell division and proliferation. Well-organized or programmed cell death (apoptosis) is an intrinsic mechanism of our human body playing in various physiological and pathological processes during evolution. This type of programmed cell death (PCD) is essential for development of highly cellular organisms. Apoptosis plays a major role in embryogenesis and many diseases like neoplasia, necrosis, acquired-immunodeficiency syndrome (AIDS) and neurogenic disorders. It releases new essential activated death receptors and mitochondria, which are the beginning of the pathway proposed for initiating apoptosis. This process is regulated by intra-and extrasomatic signals. Damage of cell results in activation of a family of caspases (CASP). Caspases are released by inactivated proenzymes activating various organelles in cytosol and nucleus. This leads to cellular monopoly change and cell death. Uncontrolled mechanisms of signals lead to pathology in the body. Hence, clinically much pathology is the ultimate result of either increased or decreased apoptosis. The use of cannabis, both medicinal and recreational, is growing. There are three main forms of cannabis: Marijuana, hash and hash oil, all of which contain the main psychoactive constituent THC. Many people are getting addicted to Marijuana, ignorant of its harmful effects on health. Today, cannabis abuse is a major concern because of its negative effects on general and oral health. Cannabis users are more prone to develop dental caries, xerostomia, alveolar bone loss, pre-cancerous oral lesions and other oral infections. The debate over the personal use of marijuana in around the world is extremely contentious with supporters for decriminalization and legalization, and others who assert the importance of strict prohibition. Public should have the best information at their disposal about the harms and risks associated with using cannabis in any form. The present review will throw a spot light on the global prevalence of cannabis use and some of the important oral health effects of cannabis abuse, which are an important concern to a dental professional. This review reminds us about nature's hand in healing and relieving some of the cumulative trauma disorders commonly associated with dentists in general and endodontists in particular. This depicts the problems we face in our day-to-day practice like backache, carpal tunnel syndrome, cervical spondylitis, chronic bronchitis, hand arm vibration syndrome and the different natural therapies available to gain relief from the associated symptoms. Pregnancy epulis is a pyogenic granuloma of the gingiva, which develops rarely during pregnancy in women. Here, we report an unusual case of pregnancy epulis in a 20-year-old pregnant woman, which was surgically excised and give a review of the literature. Ludwig's angina is a rapidly progressing cellulitis characterized by the bilateral involvement of the submandibular, sublingual and submental spaces. It typically originates from an infected or recently extracted tooth, commonly the lower second and third molars. We present a case of Ludwig's angina in a 50-year-old man. Crown root fractures are seldom observed in the primary molars. The extensive involvement of the pulp dictates the treatment of such teeth for extraction. Early extraction of primary molars can lead to transient or permanent malocclusion, esthetic, phonetic and functional problems. 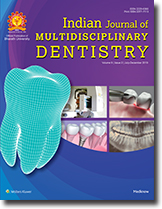 The aim of this case report is to describe the diagnosis of an unusual complicated crown- root fracture involving the primary molars of a 4-year-old girl child as well as to describe its management in order to preserve them as a functional unit of the dentition. Adenomatoid odontogenic tumor is an uncommon odontogenic lesion, composed of odontogenic epithelium, characterized histologically by duct like structures with amyloid like deposits, noninvasive lesion with slow but progressive growth. Here we are reporting a case of adenomatoid odontogenic tumor in a 16-year-old female patient in the maxillary region. This paper provides the controversies regarding its origin and management in light of recent findings, clinical, radiographic, histopathologic and therapeutic features of the adenomatoid odontogenic tumor. Sodium hypochlorite (NaOC1) is a broad-spectrum antimicrobial agent effective against bacteria, spores, yeast and viruses. It provides 100% bacterial reduction as it contains 50 ppm available chlorine at 6.7-10.7 pH at 200 C in one minute. 5.25% NaOCl solution has a pH 11-12 and it provides immediate antibacterial action during root canal irrigation. 2.5-3% solution has a pH of 11-12, which also gives good results. Grossman (1978) and others observed healing of large periapical lesions by nonsurgical methods using NaOC1 solution, though the exact mechanism of healing is not clear but it is proved that NaOC1 has good action against bacteria. Every individual with discolored teeth desires to have whiter teeth. Bleaching corrects or improves the color of teeth, and it is also the least expensive esthetic treatment option. Introduction of Lasers in dentistry has led to a new era of dental bleaching. Clinical practice has shown that it avulsed teeth are replanted after a delayed extra-alveolar time it compromises the prognosis of replantation. In case of delayed replantation, the use of adequate media for storage and transportation of avulsed teeth may improve the prognosis considerably. The case reported in the study is of an accidentally avulsed maxillary right central incisor that was kept in milk from the moment of trauma until its replantation, 30 minutes later. One year follow-up revealed absence of root resorption, ankylosis or abnormal mobility, which demonstrates the feasibility of keeping avulsed teeth in milk.